Clip on the compact and colorful Clip Jam™ digital music player and take it anywhere! The bright one-inch screen and big navigation buttons make it easy to drag, drop and play files in popular audio formats including AAC. Add even more music via the microSD™ card slot4 for up to 18 hours2 of big sound. This ultra-small, wearable music player offers 8GB3 storage, and comes with a built-in microSD™ card slot4 so you can add even more songs or audiobooks. 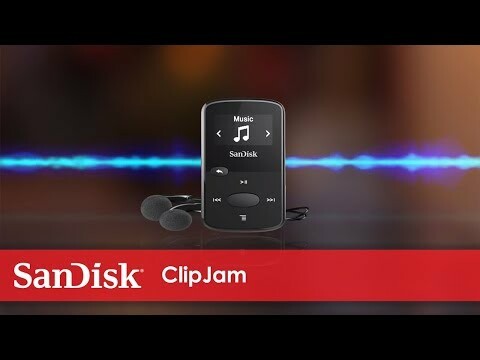 You’re free to play your whole music collection on your Clip Jam™ player. Simply drag, drop and play the tunes you want to hear—whether they’re MP3, WMA (no DRM), AAC (DRM-free iTunes), and Audible (DRM only). The Clip Jam™ player is your own personal DJ. The Clip Jam™ player comes with user-friendly navigation. The one-inch screen is bright and easy to see and the buttons are big enough for all sizes of fingers to use with confidence. The result is, you always know where you are and what you’re hearing. Bottom line, a music player you wear as often as your favorite sneakers has got to sound great. The Clip Jam™ player does. It delivers sound so rich and deep you’ll wonder how it can be so small or so affordable. Your Clip Jam™ player will keep playing for up to 18 hours2 on a single battery charge. It comes in such great colors that you may have trouble choosing just one and it includes a built-in FM radio tuner and comfortable earphones. 1. Based on 3.5 min. songs. Approximations: results may vary based on file attributes, and other factors. 2. Based on continuous playback at 128 kbps MP3. Actual life and performance may vary upon usage and settings; battery is not replaceable. 4. Card not included; sold separately. 5. See www.sandisk.com/wug for more information.